The diversity of the country is also reflected in the climate in Mexico. There are different climatic zones in the state, from sub-tropical to alpine. Basically, the lower-lying regions are warmer and tropical. The higher regions are milder. Moderate temperatures prevail throughout the year, due to the proximity to the equator. The exception is the highlands, where it can be really chilly. Even snowfall is not uncommon here. Due to the size and location of Mexico, there are regional differences in the climate. For example, the northwest is characterised by a desert-like climate, blown in from California. The tropical climate on the east coast is provided by the currents coming from the Caribbean. The north of Mexico is under the climatic influence of the USA. Here it can be cold in winter and the summer is wonderfully warm. In the table below you’ll be able to see the day and night temperatures for Mexico. Furthermore, you can see how many days it rains on average and how many hours of sunshine the days you can expect per month. Note that these are averages for the entire country. Depending on the region, there can be big differences. When is it the rainy season in Mexico? When is the hurricane season in Mexico? Basically, the European winter months are the best time to travel to Mexico . From November to April you can look forward to fantastic weather conditions. During these months, the dry season is in Mexico and the number of rainy days per month is at the minimum. With an average of six to seven hours of sunshine a day you can enjoy your break in Mexico on the beautiful beaches. The air temperatures in the dry season are around 22 to 31 degrees Celsius. Summery warm, but not too hot to get to know the country and its people. At night, temperatures do not drop below 20 degrees Celsius. You see, in the months of November , December , January , February, March and April awaits you perfect weather for a Mexico vacation . All year round, summer temperatures prevail in Mexico and the popular bathing region of Acapulco. You could travel to Mexico all year round if you wanted to! The rainy season in Mexico takes place in the months of May, June, July, August, September and October. August and September are the wettest months of the year with 12 and 13 rainy days. Even in the months of June and July, the rainy days are in the double digits. The rain during these months normally arrives in the afternoon, in the evening or at night as heavy rain showers . Thunderstorms often accompany the showers. Once it’s over, you can look forward to wonderful holiday weather again. An advantage of the rainy season: prices for Mexico holidays are much cheaper than during the dry season. There are fewer tourists on the road and you can look forward to empty beaches and hotels. Another advantage: during the rainy season, the vegetation shows its full splendour. Everything is flourishing and thriving. 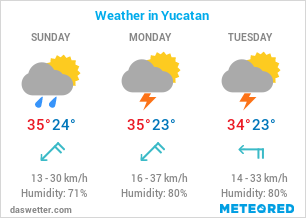 If you don’t mind the odd shower here and there, you can also travel to Mexico from May to October. Note, however: In the rainy season also coincides with the hurricane season! Once the rainy season in Mexico begins, the hurricane season won’t be far behind. It lasts from the beginning of June until October. As a general rule, hurricanes occur most frequently between August and October. Nevertheless, the likelihood that a hurricane will actually hit areas such as Cancun is very low. Cancun is the tourist capital and one of the most popular tourist destinations in Mexico – hence why I’m dedicating a separate section to it. Cancun is located in the Yucatan Peninsula in southern Mexico. The best time to go to Cancun are the months from November until April – dry season in Mexico. Temperatures are just below 30 degrees and rain is very rare, while at night, temperatures fall just below 20 degrees Celsius. Most rainy days per month are recorded in January with a maximum of four rainy days. The sea is nice and warm at 24 to 26 degrees Celsius, perfect for swimming and swimming. Due to the extremely hot temperatures, the many rainy days and the high humidity, I wouldn’t recommend you travelling to Cancun during the rainy season. However if you can cope well with these extreme weather conditions, there is nothing in the way of a trip to Mexico at this time of year! Because of the summerly temperatures all year round, Mexico is a good destination for the whole year. However, you should keep in mind regional differences when planning your holiday. If you want to enjoy an excellent beach holiday with little rain in Mexico, then you should visit the country in the dry season . For this reason, the months November to April are the best time to travel to Mexico. Those of you who want to avoid the tourist crowds, full hotels and steep prices should travel during the months of May until October. Sure, it may be the rainy season, but you can still look forward to summer temperatures and wonderful weather in Mexico. Before you decide for your personal travel time for Mexico , you should pay attention to regional differences. For example, if the weather is beautiful in the south, the north will be cooler due to the climatic influences of the US. Other examples are Cancun and Mexico City. While temperatures in southern Cancun are around 26 degrees Celsius year-round, Mexico City has milder temperatures – that’s because the capital is at an altitude of over 2,000 meters! Get all the inside tips on the climate of the stunning country! Plan the perfect holiday to this stunning island!